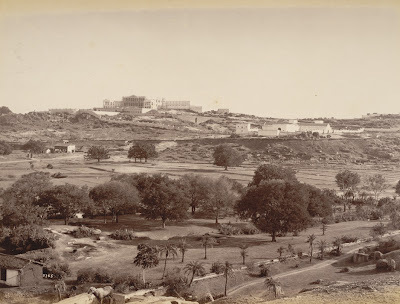 A view of the Falaknuma Palace, taken by Deen Dayal in the 1880s, from the Curzon Collection: 'Views of HH the Nizam's Dominions, Hyderabad, Deccan, 1892'. Falaknuma Palace, literally 'Mirror of the Sky', was designed in 1872 by an English architect as the private residence of a rich Muslim grandee. In 1897 the Nizam purchased it for use as a guest house. The main part of the building is classical in style with a two storey verandah carrying a central pediment. Another smaller building to the rear, which once housed the zenana, is designed in Indo-Saracenic style. The interior is opulent with an Italianate staircase and a fountain in the marble entrance hall, lined with portraits of British Governor-Generals. The future King George V and Queen Mary stayed here in 1906. This is a distant view of the palace from an opposite hillside.